The first advice on good Jack Russell car safety I would like to point out is to remind the owner that we have some extreme summers and winters in the world now adays and it only takes a few minutes for a car to reach killing temperatures, especially for small dogs like Jack Russells. Heatstroke and hypothermia is a real problem for dogs in closed cars. If your destination is not a place where you can bring your dog inside, then either leave him at home or with a sitter and don't take the chance thinking a few minute won't matter. Many a dog have been lost over the last decade because of this under-estimation. If you have no sitter and you can't leave your dog at home alone because he's a rascal, like my Annie, then another option that I use often is a pet carrier. Not only will your pet get to go with you everywhere, but he'll love the ride. Speaking of riding, when a dog travels in a car he should be well behaved. A dog that jumps around can be deadly in a moving vehicle. He should be trained to lay down in the back seat. It's a good idea to get your Jack Russell used to car travel at a young age. 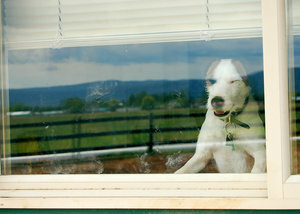 Taking the anxiety out of car travel can be an important part of your Jack Russell car safety plan. A good time to start is when your puppy is 8 to 12 weeks old. First, just introduce your puppy to the car, let me move around and sniff without going anywhere. Provide a random treat to make to associate the car with a positive experience. Once your puppy gets used to the car, go for short rides, increasing the car ride length over time. Go with another person who can hold the puppy in the back seat. Puppy Jack Russell Care Safety TIP: Make one of the puppy car rides to the pet store where you either buy your dog a treat or a new toy. At age 16 weeks or older, go for a walk at a local park (after your pup is completely vaccinated). Also, get your Jack an ID tag in case a car door opens and your Jack decides to take off and explore. Crate training can also be used in the car. Ride with your Jack Russell in the crate on short car rides, and then extend the distance. To make the crate a pleasurable experience, provide an engaging toy such as a Kong Toy. 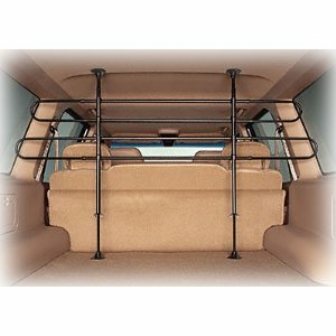 If you have a SUV or wagon, then you can use a pet barrier. Example of a typical Pet Car Barrier to keep your dog safe when driving. 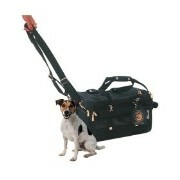 This approch or using a crate can be the best Jack Russell Car Safety approach for an active dog. If you prefer, instead of a crate or barrier, use a dog safety harness to keep your Jack in place and safe as shown below. Don't let him stick his head out the window either. I know this is a temptation because they love sniffing all those diverse smells and he looks so cute with the wind blowing in his face, but dogs have been known to jump out. Also getting something in his eye is a possibility. 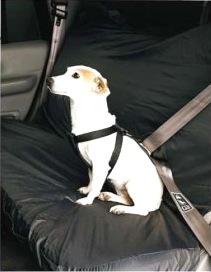 Jack Russell car safety is a serious matter and I cannot recommend enough doggy seat belts. This takes the work out of making a dog lay down and allows you to drive with ease and less worry about your dog being killed in an accident. That makes for happier trips as well as safer ones too. Let it be noted that letting a dog ride in the back of a truck is a really bad idea, especially with Jack Russells because if they see something they consider half a threat they are gone, gone, gone. But any dog breed riding in the back of a pick-up can be a danger to all involved. 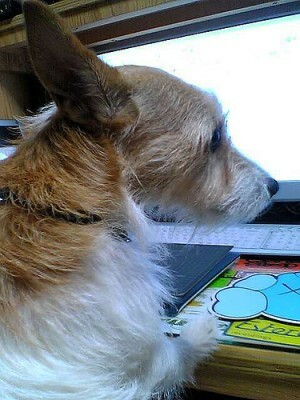 It's just not a good idea and goes against everything we know about Jack Russell car safety. Jack Russel Car Safety Tip: For long car rides bring along a water jug for your dog, something that will be handy if your car breaks down and your Jack needs a drink. To treat dog car motion sickness you can purchase a homeopathic product called EasyTravel, which contains several natural ingredients that can help a dog with motion sickness. As an alternative, ask your veterinarian about using the human medication Dramamine (dog Dramamine dosage for motion sickness is 2 to 4 mg per pound of body weight every 8 hours). We all love taking our pets along on trips, but it never hurts to carry with you the good tips and/or hardware that will protect ourselves, other drivers, as well as our beloved dogs. Also, be sure to stop for bathroom breaks. We also suggest postponing any feeding until car travel for the day has ended to avoid any problems. This is all good advice for anyones Jack Russell car safety plan.